How Many Calories Are in a Piece of Domino's Pizza? 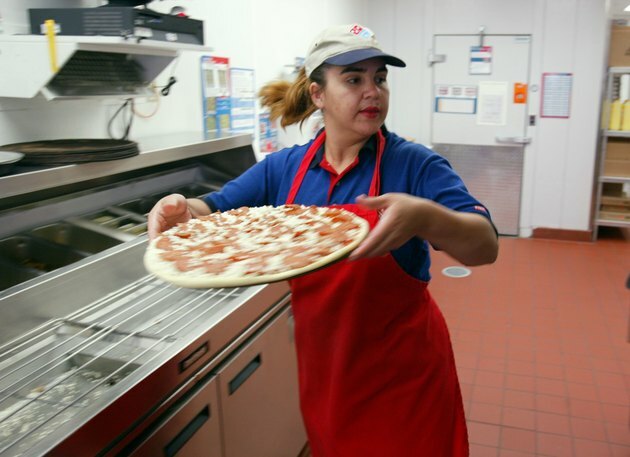 From its humble start in 1960 in a single store in Ypsilanti, Michigan, to more than 9,000 locations across the world, as of publication time, Domino's Pizza has become a fixture in many U.S. cities. Whether you enjoy the rich flavors of a pizza loaded with several varieties of meat or favor the tropical taste of ham and pineapple, your slice of pizza has a high caloric content due to the cheese, meats and dough. Domino's doesn't provide caloric details for individual slices but gives consumers nutritional information per entire pizzas. If you enjoy a large Feast Pizza, for example, which includes varieties such as America's Favorite, with pepperoni, sausage and mushrooms, or the MeatZZa, with pepperoni, ham, sausage and ground beef, expect the full pizza to contain between 1,620 and 3,440 calories. Hand-tossed crust pizzas are cut into eight slices, which means your Feast Pizza slice contains about 203 to 430 calories. A slice from a large American Legends pizza, which includes varieties such as Cali Chicken Bacon Ranch, with chicken and bacon, or the Honolulu Hawaiian, with ham and bacon, has between 230 and 500 calories.